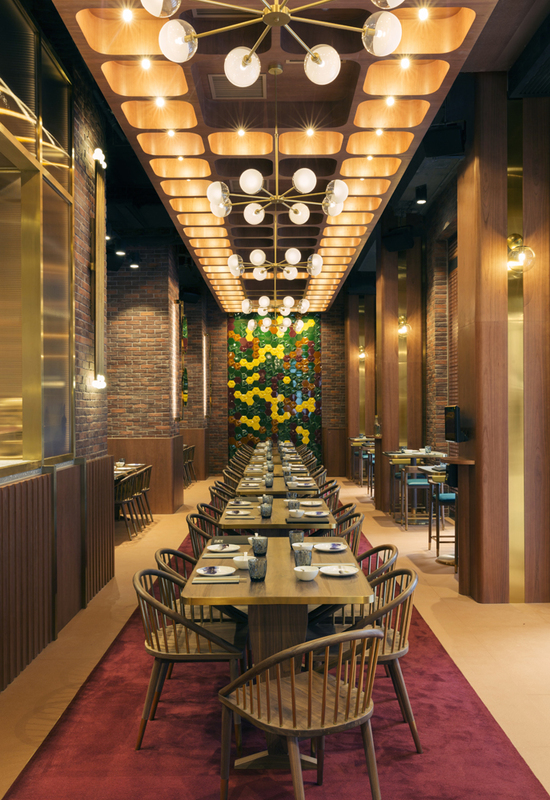 Pinot Duck is a 3,600 square foot 60-pax restaurant set street-side on the ground floor of a new residential tower designed by MAKE for Vanke Developers, located in the heart of Hong Kong’s once-Red Light bar and entertainment district, Wanchai. The menu, serving mostly duck cooked and prepared in a variety of Chinese and pan-Asian recipes, are paired with select wines using pinot grapes. 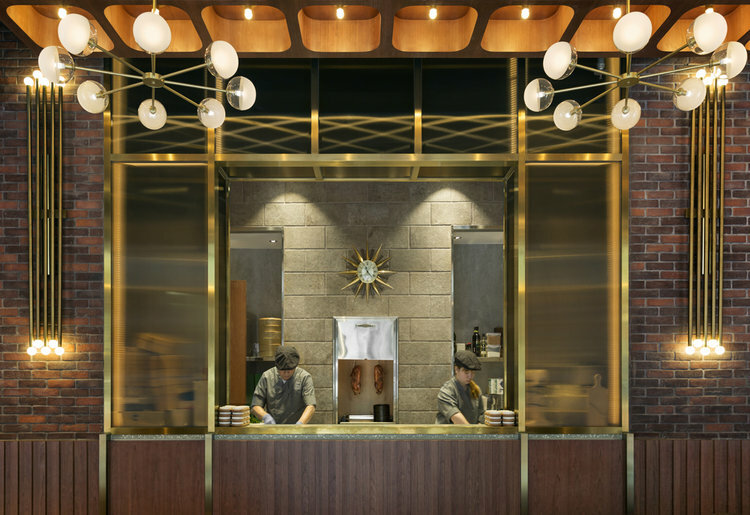 The street side location, combined with wine and sharing plates, inspired our designers to formulate an interior space focused on family, friendship, and camaraderie where lighting, comfort, and materiality frames the experience of eating oven-fresh Duck dishes. 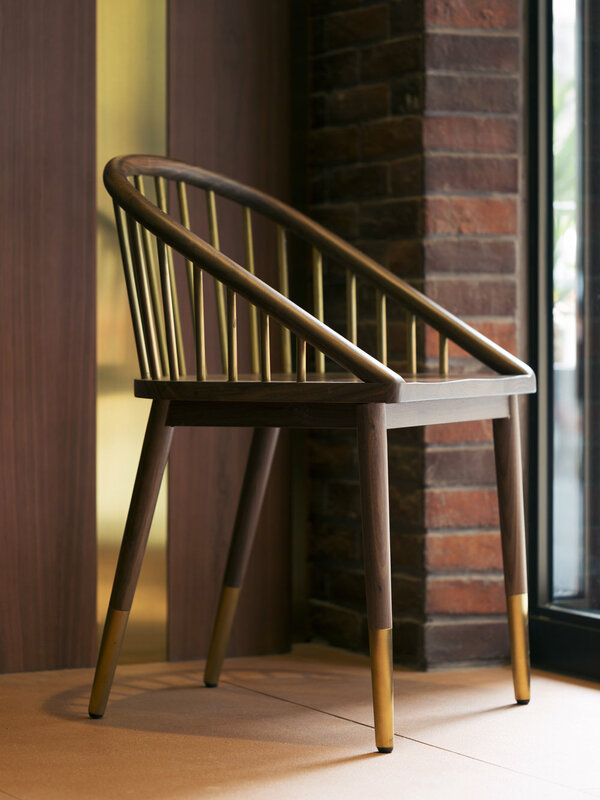 The principle use of hard walnut as the main baseline timber finish gives weight to bespoke tables and chairs designed by JJA / Bespoke Architecture (JJA/BA) and fashioned with Mid-Century Modern influences to underpin main customer touch points and impression. 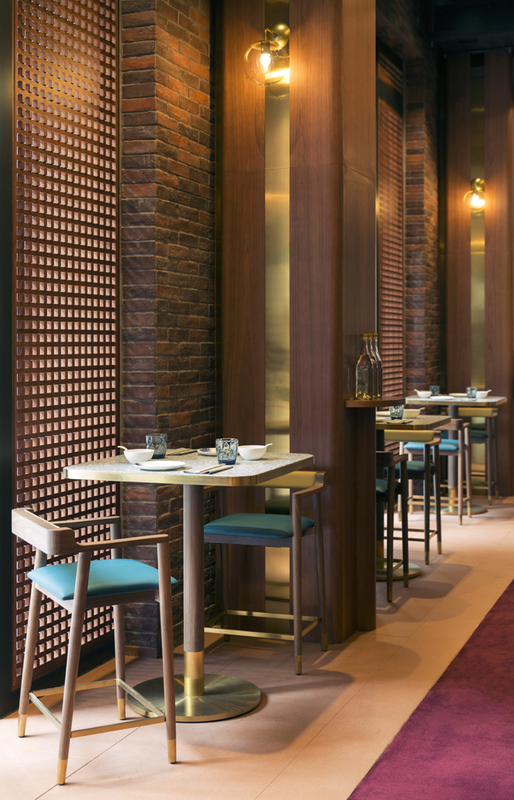 Other materials like the handmade kiln-produced bricks in three tones, a feature wall accented with hand-glazed Italian ceramic tiles manufactured by Etruria Design, the use of copper tinted textured glass finishes, the burgundy-red carpet aligned central to the space, and the antique brass metal-work, gives an experience that is warm yet nostalgic to the nature of dining over Chinese Peking, yet casual enough to make the experience relaxed, comfortable, and enjoyable for operations, hospitality, and most-importantly, the end-user. 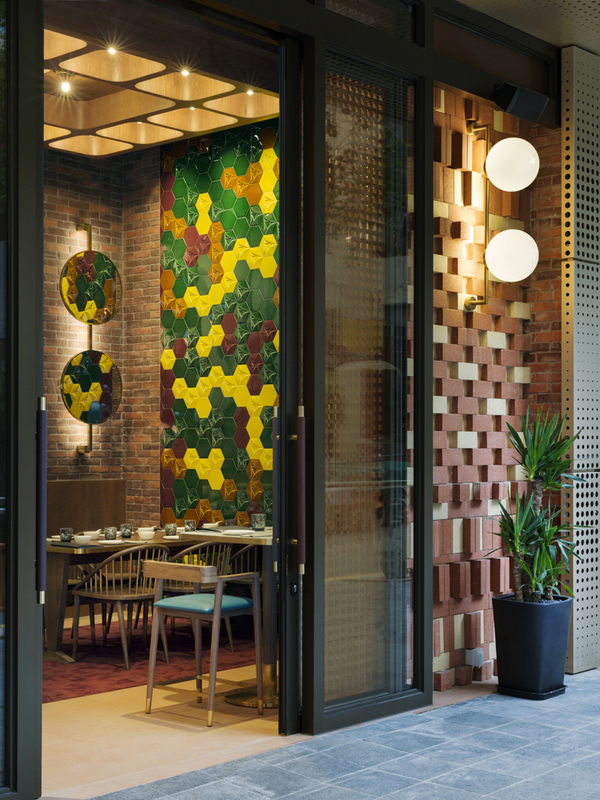 The Architectural use of timber and brick within the double height space takes formal cues from late 70’s and early 80’s Tropical Brutalist architectures of Brazil and the Philippines, while the rhythmic brick facade defining the restaurant’s five pillars, is inspired by North African brickwork. 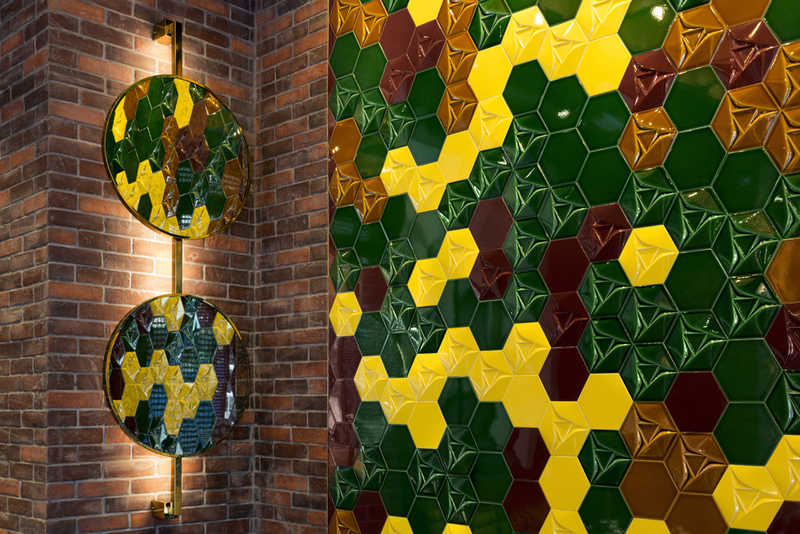 As the restaurant’s menu celebrates duck cooked in a variety of ways, so to our aim to take materials like brick, timber, brass, stone, and tile, using a number of playful moments throughout the project. Other design items to note; while some brass lighting fixtures were designed specifically for the project, the restaurant's five ring-like chandeliers were supplied and fabricated by Il Fanale from Italy, while the smaller brass light fixtures come from Washington State's RoanaokCo. All brass pulls and some ironmongery were sourced from the US and Australia. This is the first project in the world to utilise soap dispensers from Buly 1803, fabricated of stainless steel and marble. Additionally, Hong Kong-based artisan, Katol of Start From Zero, hand-painted the shop's gold and black signage on the restaurant’s facade. Overall, the project from concept design planning to completed construction worked with a timeline of 9 months- within a project budget estimate of about 10 million Hong Kong dollars.